Raman spectroscopy has become a routine technique in gemmological laboratories since the late 1990s. It is mostly used for identification of inclusions and this is of interest in determining the geographical origin of a gem by means of specific inclusions or mineral associations. Raman spectroscopy also helps to detect treatment, e.g. modification of mineral phases during heating, or the presence of organic impregnation material in open fractures. The identification of macro samples is useful in the small number of cases where it is diffucilt to identify the sample using ‘classical gemmology’ means, e.g. 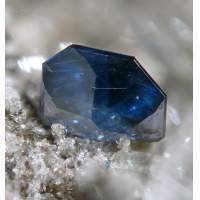 rare gems, exotic simulants, or varieties with unusual appearances. Attention is increasingly paid to the width of the Raman band, which carries information on order-disorder, which is of gemmological relevance because of the state of the crystallinity. For example, synthetic turquoise has a smaller grain size than its natural equivalent, and linewidth increases with the degree of metamictization of zircon. Resonant Raman spectroscopy has proved very useful in identifying pigments in pearls and corals, even in the identification of protected species. This helps, for example, to establish whether pearl or coral colour is natural or due to artificial dyes. Finally, laser photoluminescence spectra of gems obtained on a Raman system are now routinely collected, often at liquid-nitrogen temperature. Originally this was the only way to separate natural colourless diamonds from those turned colourless by high-pressure, high-temperature treatment. Recently, this approach has expanded into the study of Cr3+luminescence in spinel and corundum.